in nature, in women, in abstract shapes. Karl has also been inspired by playing card designs of the late 19th and early 20th centuries, and has re-worked these in his own individualistic style. Karl assumes the role of artist, designer and the man behind the machine (craftsman) in that he performs all the stages of production himself. Although playing cards in general rarely rise above the level of industrial art - a minor craft - the richness of the goldsmith or illuminator are often imitated on paper and Karl’s skill as an engraver can amaze and beguile us. In general Karl leans towards humanity in his designs, and he gives a distinctive gothic flavour to his subjects. He reveals a feeling for natural beauty and artistic rhythmical movement. But what unconscious forces or romantic ideals inspire him? 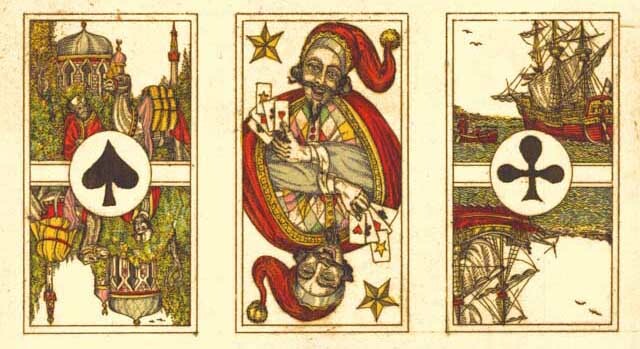 What is the lyricism which comes through the playing card designs? The variety of design sources brings a certain originality into Karl’s work, a mixture of individuality, grotesqueness and quaintness, which suits the medium of the playing card. The romance of distant lands finds expression in the exotic blend of Turkish and Hindu fantasies (Patience Indien No.16*, Cartes Turques No.18, Cartes Indiennes No.35), whilst the theme of sea-borne trade and adventure, suggesting contact with remote civilisations, is again carried further (Four Corners No.10, Triton No.31 and The Dragon). with it’s torments, illusions, dreams and hopes. Above: No.10 'Four Corners' (1984). Part of uncut sheet, printed from copperplate etching on one sheet of Daler Ford cover paper, on the reverse a pink wash. Hand coloured, pips added by stencil. This is a double-ended copy of Dondorf's "Four Corners of the Earth" pack of 1870. The courts show exotically dressed figures from around the world. Each card measures: 75 x 44 mm. Above: No.18 'Cartes Turques'. Partially coloured uncut proof sheet, printed from copperplate etching onto goatskin parchment paper. Dated 12/85 and 5/86. 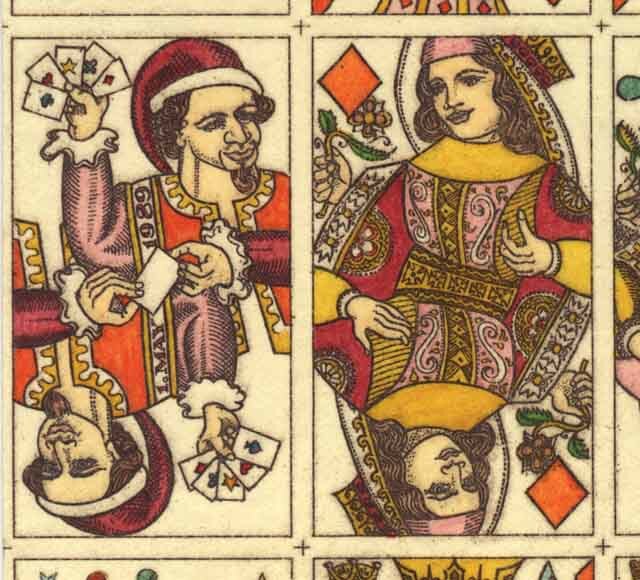 Above: Queen of Diamonds and a Joker from Karl's pack No.28 'Mayday' (1989). Printed from copperplate etching on Daler Ford cover paper. Hand coloured. Each card measures: 72 x 40 mm.